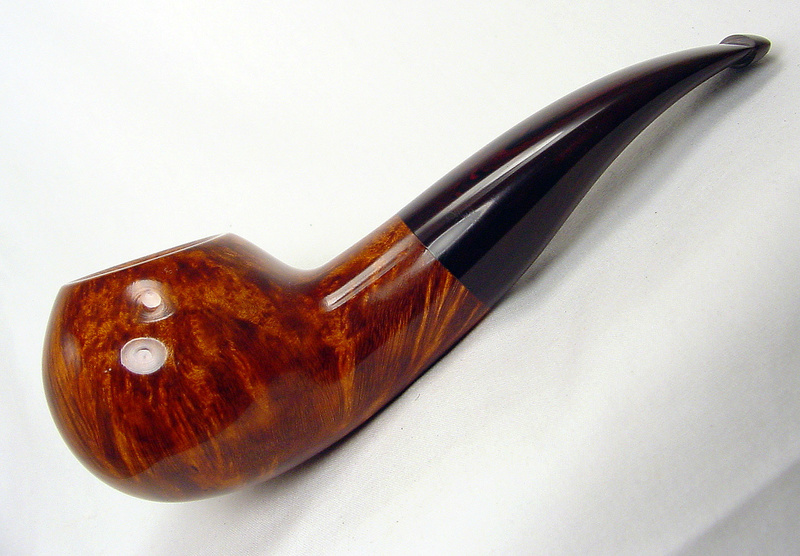 MacBaren Golden Extra in a 1983 medium bend, mostly smooth, bottom rusticated Butz-Choquin Maitre Pipier 3 Fait Main with pearl brown acrylic stem. Ice water and bergs is my evening drink. Not far from finishing this bowl of Gurkha Urban Legend in a 2002 Ser Jacopo Delecta Fatta A Mano R1 sandblast Rhodesian with a smooth extension at the shank with a black acrylic stem. A couple minutes away from smoking HU Directors Cut in a 1938 straight black grain relief Dunhill OX Shell bulldog with a silver band repair and a black vulcanite stem. I was lucky enough to purchase 6 tins of Gurkha Urban Legend for $48.00 from a VERY reputable tobacco private seller from another pipe forum I use to belong to, we still keep in touch. This is well worth the money and very definitely an all day smoke with absolutely NO BITE even if you push this tobacco at a heavy pace. So, in about 45 minutes or so this will be my last pipe full for the night, just did not decide on the pipe yet. A quarter of the way through this bowl of Half&Half in a tan etched medium bend 2001 Rinaldo Sahara 2 Acorn round at the shank, pointy at the opposite top with a black acrylic stem. A couple minutes away from smoking P&W Nut Brown Burley in a 1984 medium bend black grain etched Savinelli Non Pareil 9310 poker with a horn ferrule and a black vulcanite stem. Just finished work and this bowl of Sir Walter Raleigh in a medium bend 2002 MM Legend cob with a black stem. Uhle’s 00 in a 1979 Ascorti Business KS Oom Paul with a black pearl acrylic stem. Good morning from Greece, today supposed i will post photos with pipes from my Christmas vacations but i will make an exception. Due to a December 25 plane crash the Russian Alexandrov Ensemble choir is no longer exists, the majority of the member died so i will devote my today's pipe smoking [Peterson Sweet Killarney] to their memory. They sing in Greek at concert here in Athens at 2012, the accent of the soloist is excellent for a non-Greek. Angler's Dream in a straight black sandblast undated Savinelli Hercules 115EX pot with a black vulcanite stem. Granger, over 35 years old in my restored BBB Best Make Smooth Billiard pipe. Paid $24.55 for this pipe on eBay a few years ago and restored this pipe to like new condition. GLP's JackKnife Plug in one of my older Falcon pipes with a custom made rusticated black chimney bowl. H&H BlackHouse in my Joh's smooth Brandy bowl with a slight bend to the wide stem. Superb pipe for the price!! The maker use to work side by side with Bjarne Nielsen. Hello from Greece, a winter night here in Athens. 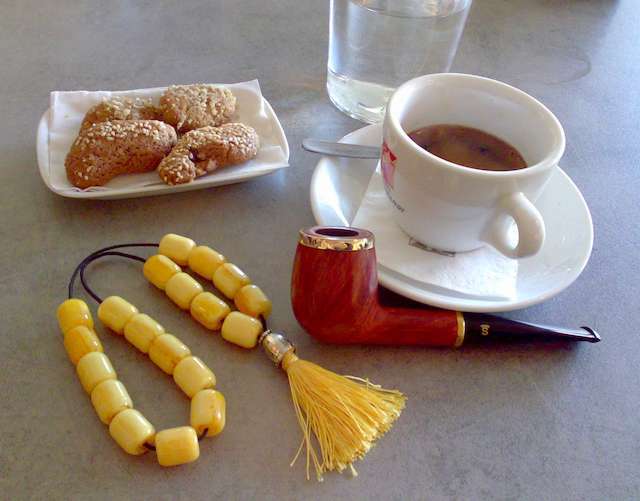 A photo from a Cafe in my vacations, the pipe turn to a "Gilt Edged" model by a Greek modification. About a quarter of the way through this bowl of Ogden’s Walnut in a 2002 medium bend smooth Rinaldo EGEA 03 Silver line spigot 10 with a black acrylic stem. A can of the amazingly delicious Hansen's Creamy Root Beer made with pure cane sugar is my drink. Watching Gunsmoke. A couple minutes away from smoking Old Dark Fired in a smooth briar calabash shape 1984 Fero Danese made in Italy with a black vulcanite stem.